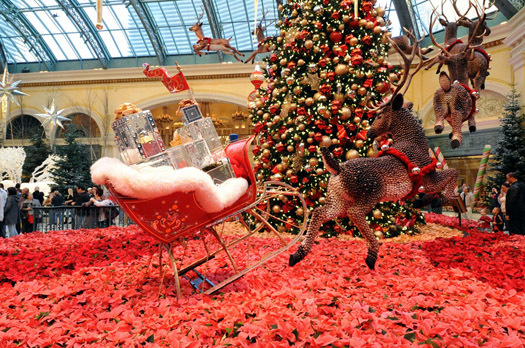 LAS VEGAS, Dec 15, 2010 / — The dazzling centerpiece of the winter exhibit is a stately 42-foot holiday tree shimmering in more than 7,000 twinkling lights and decorated with more than 1,800 holiday ornaments. The majestic holiday tree is joined by four 15-foot grand toy soldiers, a 7-foot-tall rocking horse, eight pecan-covered reindeers pulling a brilliant red-lacquer sleigh in mid-flight and a whimsical five-car toy train traveling around the base. A family of 28 still and animated penguins waddle on a patch of arctic terrain and are hard at work constructing an igloo. Nearby a polar bear family, adorned with coats made of 16,000 white carnations, tugs on the heartstrings of visitors as the baby bear frolics playfully on his back with the devoted mama bear affectionately watching. The scene is completed with three light-draped Manzanita trees standing quietly over a “reflective pond” with three massive icicle stars hovering angelically overhead.